Being a free-spirited full-timer isn’t just for retired folks. Many people are figuring out how to do it long before retirement and they’re having a ball. Take Caleb and Kristy Simpson of Austin, Texas. In 2015, these thirty-something parents ditched their traditional suburban life for nomadic RV living with kids. Kristy and Caleb Simpson with their two young children (at the time—now they have three!). As devoted outdoor sports and fitness enthusiasts, Kristy immediately knew that full-timing was the life for them. Their kids quickly adapted to RV living. Caleb and Kristy were bitten by the travel bug when they met a full-time RVing family of four at a rock climbing event. As devoted outdoor sports and fitness enthusiasts, Kristy immediately knew that full-timing was the life for them. After some gentle persuasion, Caleb agreed. RV living was the perfect way to satisfy their wanderlust. They could rock climb, run and roam wherever they wanted, but still give their growing family a strong sense of home. Newly invigorated by their new commitment to debt-free living, changing gears to a tiny home and simple lifestyle just made sense. 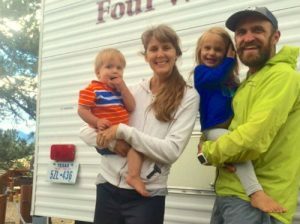 As many young families who go full-time RVing with kids experience, the people closest to Caleb and Kristy didn’t share their enthusiasm for full-timing. The family kicked things off by traveling to some of their favorite outdoor spots, like the Rockies and Utah. After deciding to give full-time RVing a try, the couple traveled to Nashville to thank the man who inspired them to live debt-free, the financial guru Dave Ramsey. Adapting to their new lifestyle was easiest of all for young Abby (age 3.5) and Josh (age 2). “Our kids are so young. Josh doesn’t even remember life before the RV and Abby doesn’t care,” says Kristy. As long as the kids know where they’ll lay their head at night, they’ve had no problem adapting to RV living, says Kristy. 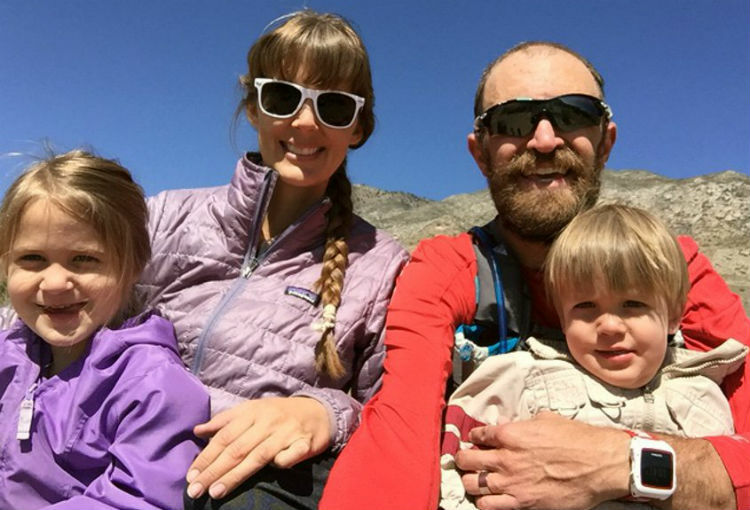 The family kicked things off by traveling to some of their favorite outdoor spots, like the Rockies and Utah. Caleb even fulfilled a dream to complete the Wasatch Front 100-mile Endurance Race. Going that great a distance was relatively easy for the 37-year old vegan athlete. 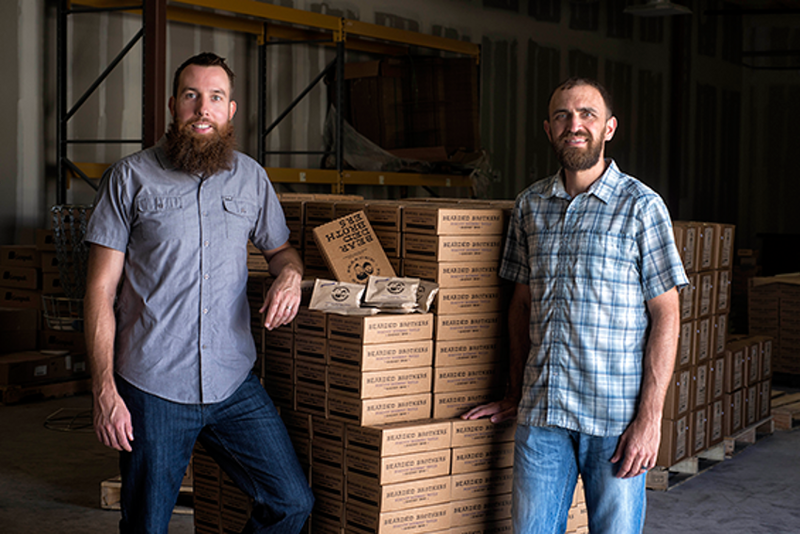 After all, his efforts were fueled by his own creation: Bearded Brothers Energy Bars. Caleb (right) with his brother Chris. Founded in 2011 with his brother-in-law, Chris, the bars are made with mostly raw, non-GMO, soy and gluten free ingredients. Even at $4 each, the tasty organic fuel is knocking out the competition at retails stores like Whole Foods. A crew of 10 employees is responsible for the company’s success. There’s a lot to manage but it hasn’t stopped Caleb and his family from living on their terms and traveling when they want to. congrats, our unconventional ‘lifestyle’ is hard for others to understand, though secretely many wished they could try it themselves. …and with children along, grandparents find it even harder to warm up to. Thanks for the great write of Rene! Hope you and Jim are doing well! Your spot in the park here remained empty for quite some time. Another couple with kids new to the RV lifestyle just moved in. They are saying a couple months, then heading north. We can’t wait to hit the road again after baby number 3 arrives. Caleb you are so welcome! We had fun getting to know you and send you all the best for lots of success & happiness. See you on the road! Been looking into trying this myself. Have 2 kids, wife doesn’t work. Figure if I can start the right online business with the right products I could full time without too much issue. I know my kids would have a blast. Congrats on making it work, you have a lot of us envious. Roy you are totally the right candidate for full-timing with kids. Don’t wait, do it! loved seeing your post, I am a homeschooling widow mother of a 10 years old girl and would love to get on the road in an RV, I did have a truck and travel trailer but could not go very far, I just do not feel safe traveling by ourselves and would love to meet other homeschoolers and travel and explore this wonderful country together, have you met families traveling together? Helen, we have met many families traveling together! Do you know about Families on the Road? Wonderful RVing group. Also, see my previous post about these two families who are currently in Alaska together. Don’t give up on your dream, you can do it!